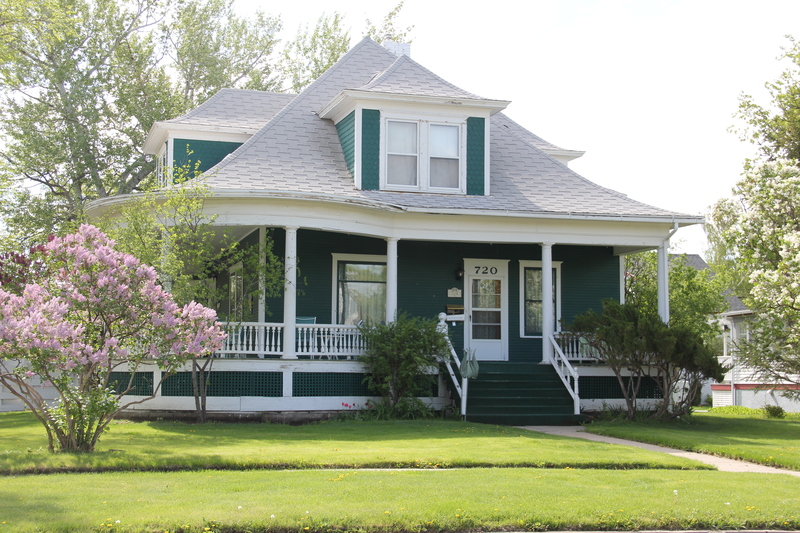 Glendive’s growth into one of the Yellowstone’s major towns in the first decades of the 20th century is well documented in its intact historic homes along Meade and Kendrick Avenues, which are located between the Yellowstone River to the west and the commercial corridor represented by Merrill Avenue to the east. 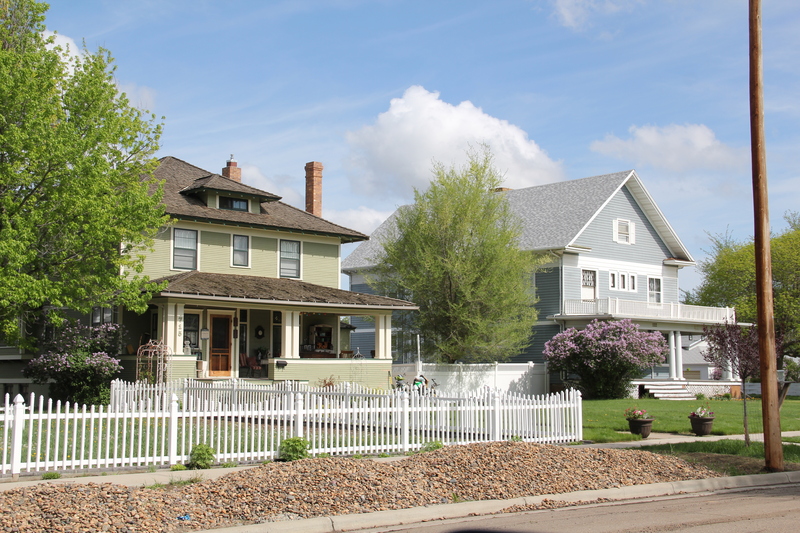 Earlier posts have identified the two key economic events–the Lower Yellowstone Project of 1904/5 and the expansion of the Northern Pacific Railway shops in the 1920s–that shaped the neighborhood. Here I want to share the neighborhood’s stylistic diversity, along with the obvious pride that owners have in their homes and town. Let’s begin with an amazing set of bungalows, one of the region’s best concentrations of this early 20th century architectural style. 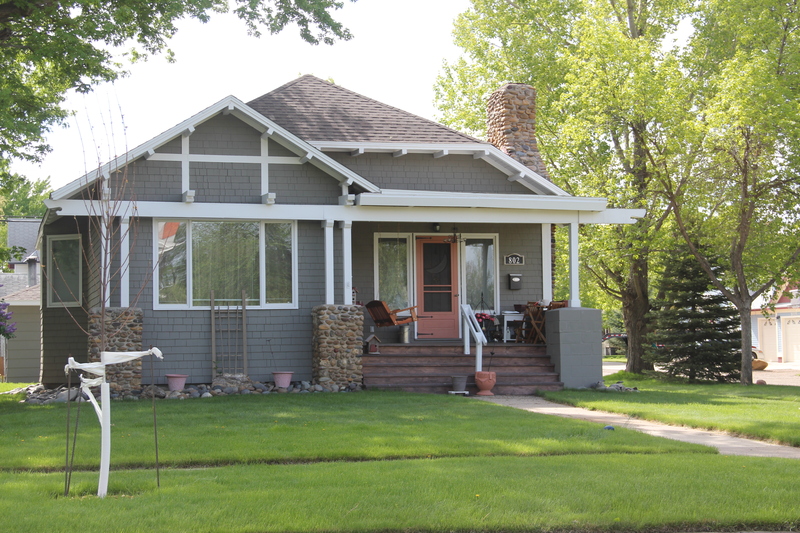 There is a mix of what are often characterized as Craftsman Bungalows, with its thatch-like shingle roofs, exposed stick work and prominent bracketed porches. 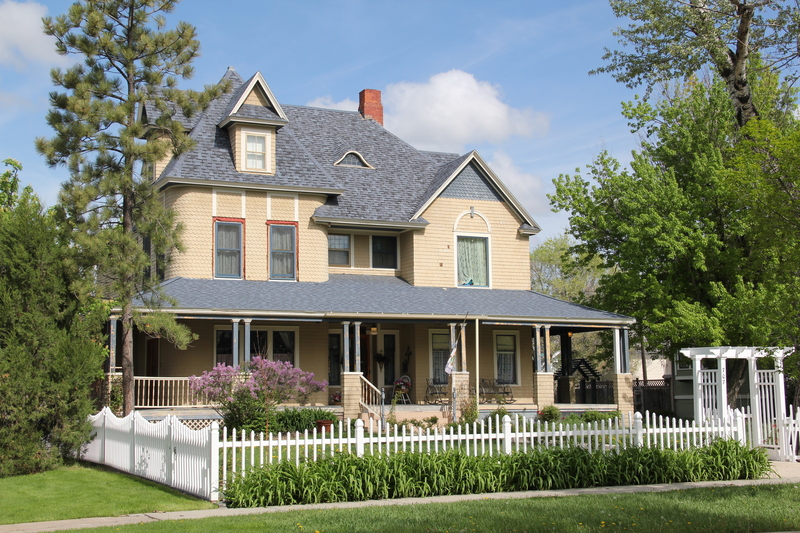 Others are more restrained in their ornament, taking on the look of a transitional design between Victorian era details and the one- and one-half story bungalow form. Next comes variations from another popular early 20th century form, the “foursquare,” a two-story, squarish dwelling, typically with a hipped roof and a less prominent porch than a bungalow, but as this example from Kendrick Avenue indicates, the Foursquare can come off looking much like a bungalow on steroids. 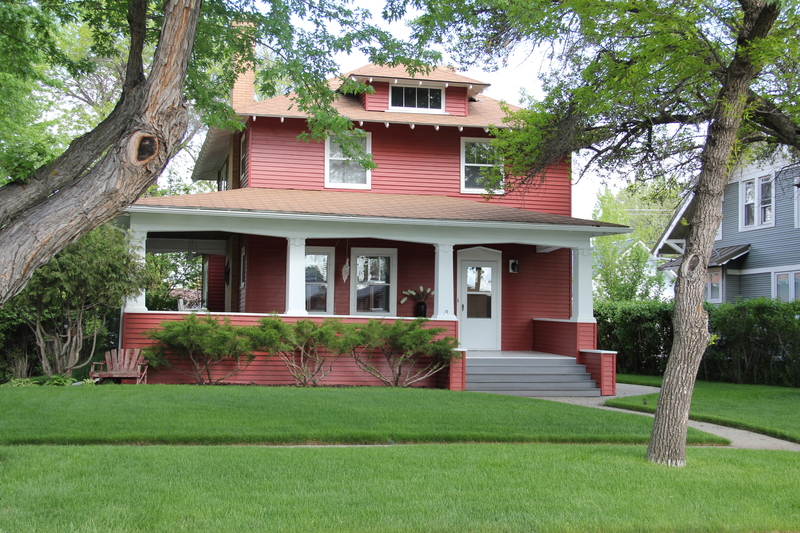 The neighborhood also has earlier Victorian styles, such as this rambling Queen Anne-style house on Meade Avenue, while just a bit farther away on North Douglas is the Krug House, an outstanding Montana example of Classical Revival-infused Foursquare design that was completed in 1907. 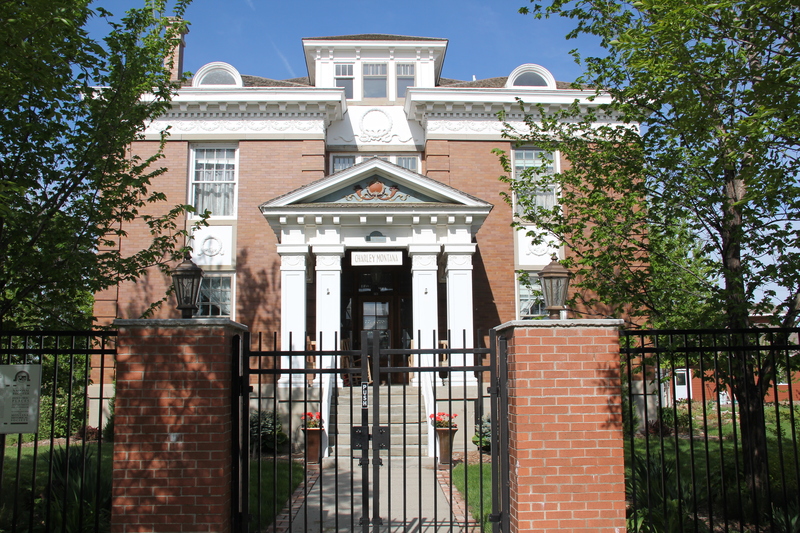 This National Register-listed property, designed by St. Louis architect Herbert G. Chivers, was the home of Charles Krug and family and definitely represents a statement house for its time. Krug wanted to prove that good money could be made from sheep–a rancher need not be only a cattleman. 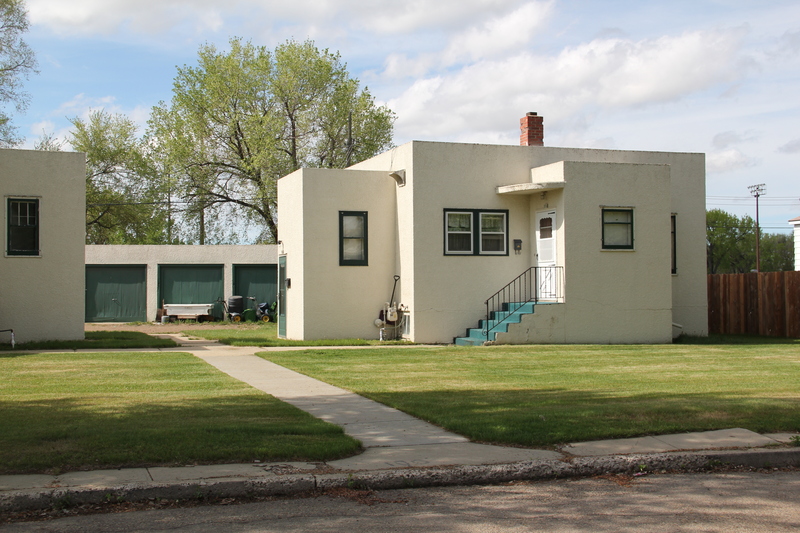 A statement of modernity comes from Gresham Street, near the high school, where this Art Deco dwelling stands out among the more traditional designs of the town. 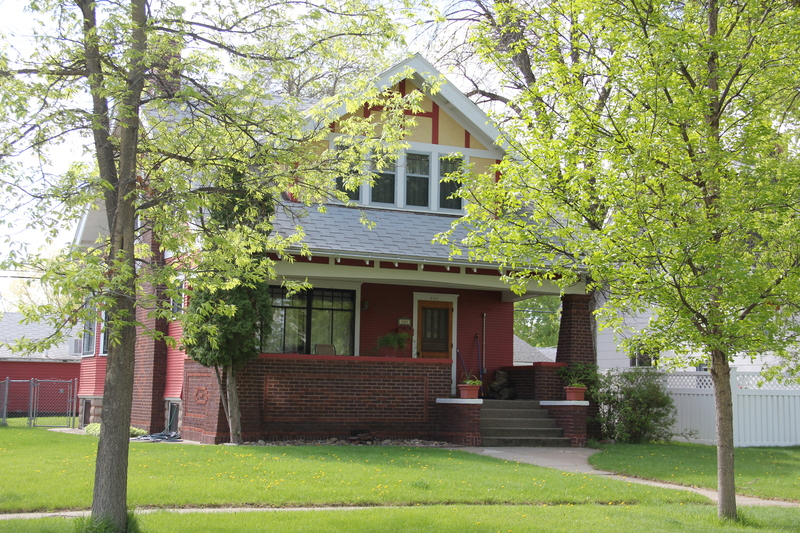 Another different statement was made by this Contemporary-style home on Kendrick Avenue, which dates to the city’s last boom in the early 1960s. 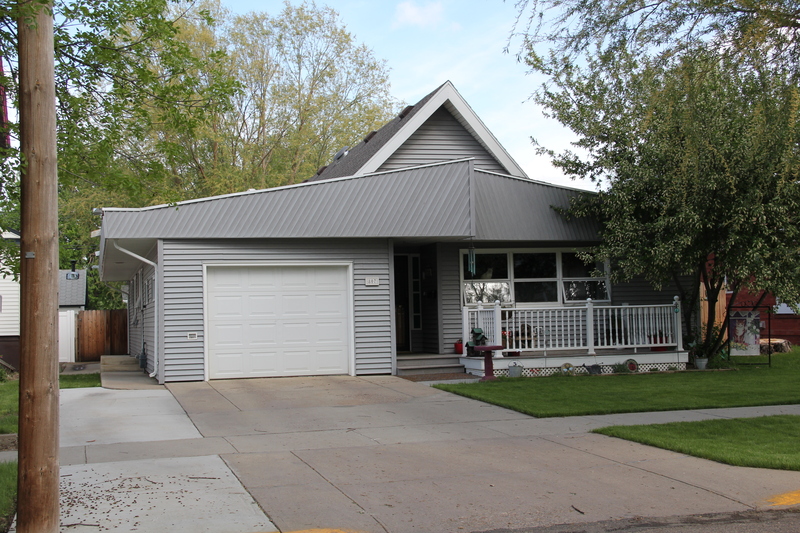 More at home in a modern suburban setting than the more formal early 20th neighborhood of Meade and Kendrick Avenues, this house, with its prominent A-frame center section and project front entrance garage states 1960s values well. 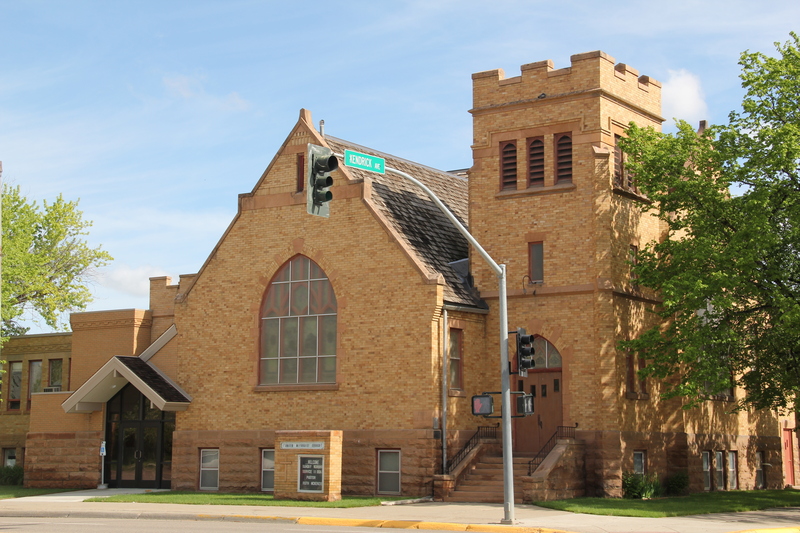 Glendive’s historic homes are complemented by its early 20th century historic churches. 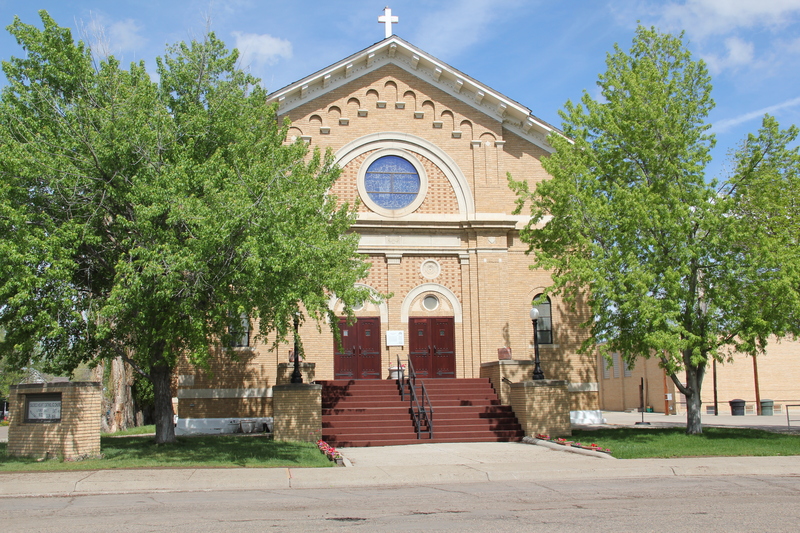 I will close with two: the Castellated Gothic United Methodist Church and the Romanesque-styled Sacred Heart Catholic Church. 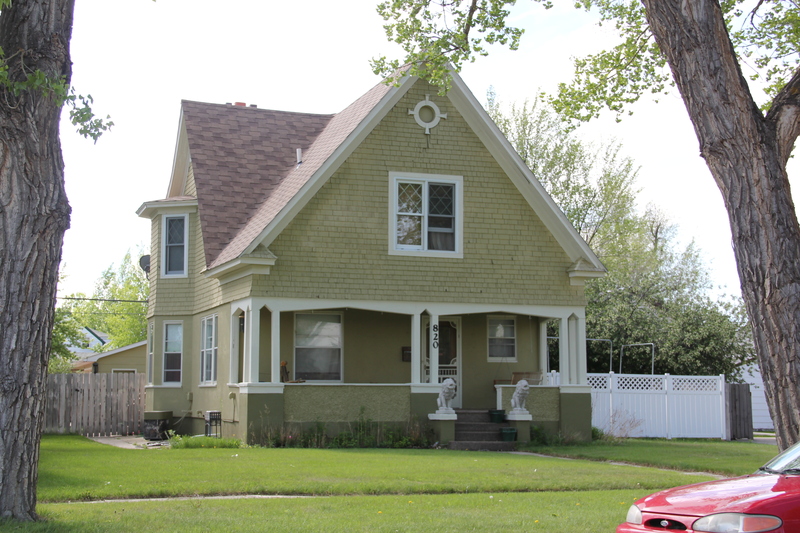 Glendive in the 1980s struck me as a town in decline but one that retained a faith in its historic buildings and houses. Thirty years later than faith seemed renewed–as the historic fabric of the town has changed, certainly, but also had been maintained even enhanced by local stewardship. 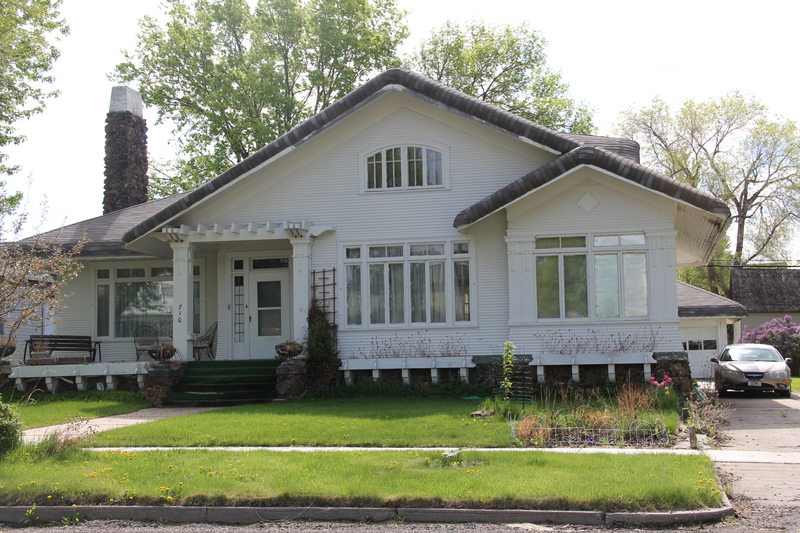 This entry was posted in Montana historical landscape and tagged Charles Krug House, Dawson County Montana, Glendive Montana, Herbert G. Chivers, Montana Art Deco, Montana bungalow, Montana four square, National Register of Historic Places by carrollvanwest. Bookmark the permalink. Aaaaahhh, remember it all well…Love the old houses!! Yeah, mine–and Theresa’s–as well. Like your hashtags,Carole!